The history of St Andrew's Church goes back to before there was a building for worship in the northern end of Radcliffe. Originally the area, known as Black Lane, came under Radcliffe Parish Church (St Mary's). Around 1857, due to the lack of a Sunday School, a gathering of children was started in a cottage on Hardman Street. They were taught by a local peddler. This cottage class was later transferred to 'The Barn, at Hardman's Fold, where the singing was led by 'Blind Betty'. The Barn was very cold and Lawrence Hall allowed the class to meet in his newly erected mill "over the boilers'. Also about this time an Infants Day School seems to have been held in Lord Wilton's Repairing Works, just over Black Lane Bridge. A new school was built by Mr Lawrence Hall, and was opeing in 1860 as a Day School, Sunday School, and School Church. For a timethere was an evening service held by Rev Evanson of Ainsworth, and later by the Rector of Radcliffe and his assistant Curates. 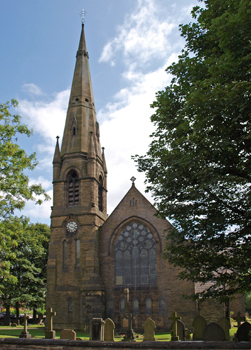 Eventually on the 12th of April 1874 the Rev S Williamson, assistant Curate of Radcliffe Parish Church, was appointed Priest-in-Charge of the 'Parish" although there was no church building. The present building was erected on a site given by the Earl of Wilton and cost £6900. Half of this sum was given by Mr Lawrence Hall, together with a gift of £500 from Dowager Mrs Starkie and Mr R Bealey, the balance being made up of many sources. Building work began on the 5th of November 1874 in a style known as 'Early English'. The building was consecrated on the 3rd of May 1877 by the Lord Bishop of Manchester, Bishop Fraser and was made a parish under the Blandford Act. Rev S Williamson was appointed Vicar with Rev H Williamson, one of the Vicar's sons(! ), becoming the assistant Curate.